EARTH DAY FLASH SALE HAPPENING NOW! Click here to register and save 25% with code GOGREEN. Join the Chamber Foundation’s fourth annual Sustainability and Circular Economy Summit: Translating Value to Ignite Action May 9—10 in Washington, D.C. Come learn the practical knowledge, skills, and applications needed to most effectively communicate sustainability and the circular economy, both within and outside your organization. 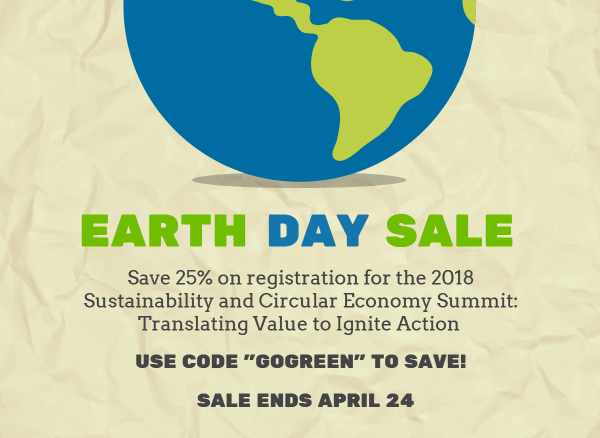 Now through April 24, get 25% off your registration using discount code GOGREEN. Click here to save.